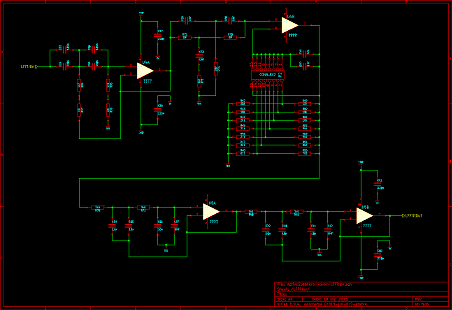 It's a very long time since I did a serious audio electronics project. I've been using a pair of Leak TL12 amps from the '50s for the last 10 years or so, along with with a pair of my own design compact speakers that get down to about 40Hz which I've been tweaking for something like 15 years now. The most recent part was the experiment in very low frequency I posted before. What I want now is something more compact, suited to the very broad choices of music I listen to (Classic, Jazz, Rock, Metal, .... well, just about anything that isn't here today and gone tomorrow), easy to live with, and most important and rarely accounted for, adaptable to different rooms and positioning. It goes almost without saying that this needs to be a fully active design. Not only is it much easier to live without separate amps and extra cabling, but this allows very high quality LR4 crossovers without the complex reactances that have to be wrestled with in passive designs. It's impractical to try and control these complex reactances in a one-off design without the extremely complex (in some cases custom) simulation tools used by the designers of commercial high-end systems. This also means that I can optimise the power amplification for each band: low output impedance with a DC servo for lows, symmetric drive optimised for transient response for highs. This is the tricky one so let's think about it first. By far the biggest part of this is Baffle Step related the the proximity of a boundary (wall). Basically, at low frequency when wavelengths are sufficiently long that on the scale of the cabinet they are just high pressure areas rather than behaving like waves, the pressure flows round the cabinet before the wave propagates. This means that at low frequency a large portion of the energy gets sent in different directions to the listener. At high frequencies the wavelengths are short enough that they leave the cabinet almost immediately and all the energy goes forward towards the listener. Depending on the dimensions of the cabinet this transition will happen at different frequencies. Then depending on how close the nearest boundary is, the amount of absorption and other factors in the room, some of the energy is sent back. This is called Baffle Step because it acts in a similar way to a basic step reduction filter at low frequencies, though in reality the response will be more ragged due to reflections causing cancellation patterns. This is well documented with the major paper about this being Harry F Olson in the JAES in 1969 and a number of subsequent sources around the web describe their approaches to compensate for Baffle Step. It's difficult to get a good scientific model for this, but John Murphy's article at TrueAudio seems one of the most referenced works based on Olson's original paper. I've taken my own approach to compensation by modelling the effect with the approach John Murphy uses and then using a Spice simulator to match real-world compensation values to achieve an overall flat response, matched with some measurements in a small number of usage scenarios. The model seems plausible though there are some anomalies which I can't be certain of with limited data. If I was doing more than this one-off for myself this would be something worth gathering a lot more empirical data on. I use a jumper on the board to set the amount of compensation in steps of 0, 1, 2, 2.5, 3, 3.5, 4 and 5dB. This should allow operation in a broad range of indoor conditions from placement right against a wall to a near-anechoic environment which will be near impossible to achieve in a practical home environment. Using a standard 8-position header I've been able to go to 0.5dB steps through the middle (most likely) steps that will be used. Before someone wants to start one of the usual internet flame wars over 0.5dB being audible, consider that this only costs a few pence, then go look at a standard loudness chart and notice that at low frequency which is what we are discussing, Human hearing is much more sensitive to small changes. Part of the easy to live with bit means a small footprint. I've gone for two 4" drivers as the best balance between low frequency extension with acceptable excursion and domestic listening levels. These are in an MTM configuration, packed snugly together to get the largest sweet spot. 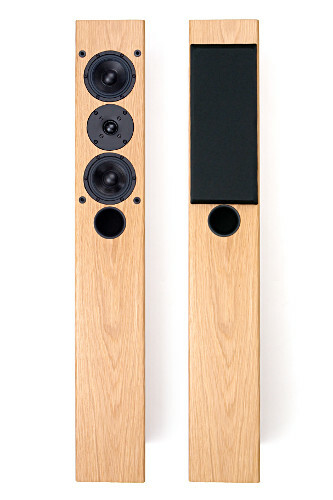 I'm going with a floorstander and the active electronics packed into the bottom half. 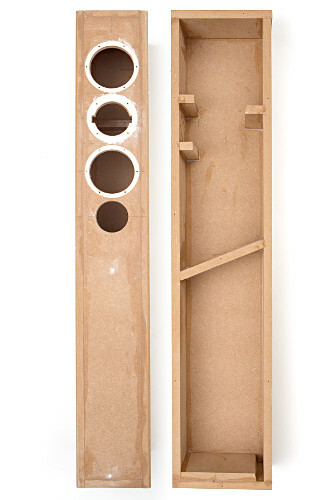 The effective cabinet volume needs to be 9 litres for the drivers and design I'm using. The one small problem that arises is that such a small footprint stability becomes a bit of a problem. To solve this I've added a spiked plinth attached with chunky bolts. Panels are small enough that I'm not overly concerned with bracing, but have have put some bracing front and back. In particular, with all the material cut away to countersink the drivers at the front I've added bracing between the drivers to reduce any flexing of the panel. 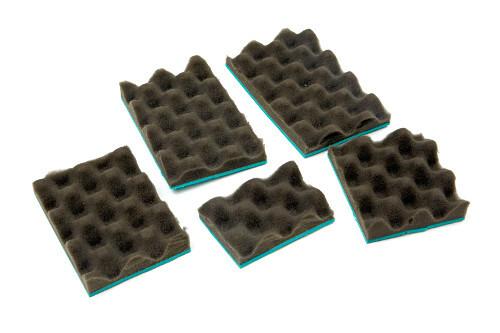 To avoid mid reflections the top and rear are lined with acoustic foam and thin felt covers the remaining hard surfaces as an additional precaution. The low end is a bit of a compromise between output and quality. 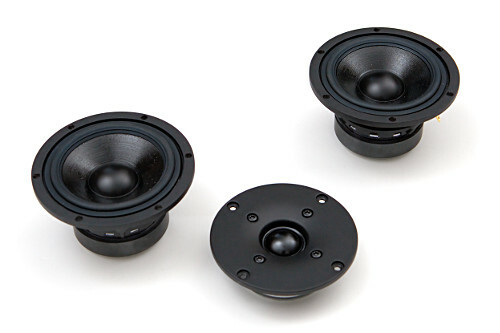 The vast majority of small (4") drivers I looked at seemed to be optimised as mids without sufficient excursion to do anything remotely approaching low end. It took a lot of searching before I settled on the Monacor MSH-115HQ. This is based on a mid driver that has had a number of positive comments in forums, but adds good excursion with respectable low frequency extension (-3dB at 50-60Hz is practical) and a cast chassis. The upper end of the response is well controlled without evidence of excessive cone breakup. This is probably due to the doped paper cone rather than more exotic materials which seem to be heavily marketed but show signs of uncontrolled resonances at higher frequencies. For the tops I've searched around and came to the Vifa BC25TG-15/04. This seems to be a slightly older than current version of this driver, but other versions have a bit of loss at the top and less well controlled off-axis response from the data I can find. This is a 6th order design (4th order ported + 2nd order active filter) which both helps get a bit more extension and deals neatly with excursion risks below the Fp of the system. With active designs there are longer runs of low level signals which are particularly sensitive to noise. To mitigate against that balanced input is a given. The initial balanced stage provides a reasonable gain to avoid degradation of SNR through the filter stages. This is easy since the clipping levels are well known through the system so little headroom is needed in the small signal stages unlike in conventional amplification for passive speakers. Another design aspect is that filters, particularly low-pass, are the last stages before the power stages. Since noise is broad-band this again works in favour of SNR. Remember that gain is fixed through the system and volume control occurs upstream so SNR is a major consideration for active designs. 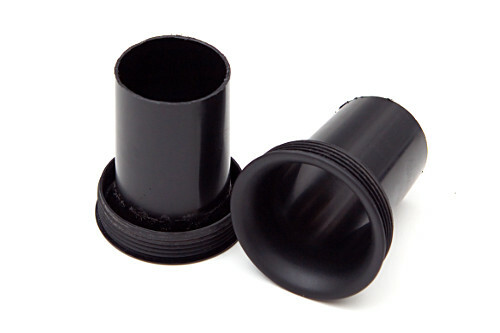 Filters have used high quality polyester or polypropylene caps depending on their usage. Crossovers being LR4 are very sensitive to tolerance so I've used 1% Vishlay Rodestien caps and then hand-matched them. Due to caps having an 1:2 ratio in LR4 LPF filters I've used parallel pairs and can pair outliers to get very close to target values. Overall I've kept all caps matched within 0.2% of target values. Before someone yells "can you hear the difference", we already know by textbook maths the answer is yes depending on the luck of the draw when it comes to tolerances for high order filters. When it comes to close tolerance components (and not the fakes going around), the demand is really only for higher spec applications so you simply are likely to find low-spec close-tolerance components. Dealing with the tolerance is relatively easy and takes the chance out of it. Given that these caps cost about 20p each from the right suppliers (take a look at what poor-quality poor-tolerance devices cost from mainstream suppliers) this one is another that is just not worth arguing about the pennies. Since I'm also going to be running my extreme sub with these it makes a lot of sense to provide a pre-filtered sub output for optimum integration. The baffle step work is also in there, and then we pass off to the power stages. I've also put some basic shaping circuitry just in case I needed to correct the response further but have this bypassed since I haven't had reason to use it - everything behaves close to predictions. For the power stages these are nothing exotic, but are very well engineered. There is 20000uF of caps on each 50V rail with star earthing and soft recovery rectifiers to avoid noise due to slow reverse recovery. Filtered supplies are provided for the drive stages to reduce the impact of harmonic currents circulating from the class AB output stage (remember each rail sees half the wave so is rich in harmonics). All supplies also have local decoupling with a high frequency electrolytic and WIMA polyester cap. It's worked rather better than expected. Normally conventional passive designs take a lot more effort to get this good since it requires months of tweaking to compensate for all the complex reactances. In this case a well engineered active design has meant everything is far more predictable and the need to tweak minimised. 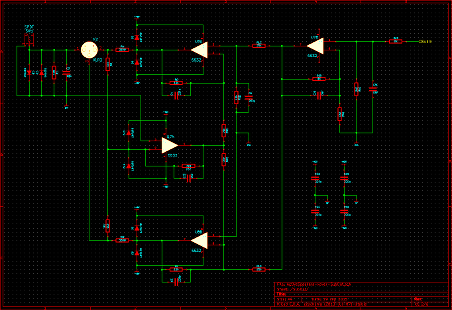 The sub output is also a winner - all I need to do is match the phase and it integrates seamlessly. I really couldn't tell you which bass notes are being handled buy the mains or the sub! Probably the most striking thing compared to what I was running before is the crisp tops of the Vifas and the even-handed treatment of the lows with the Baffle Step compensation. 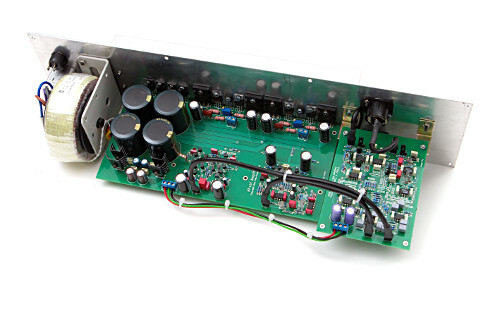 My only fear as always with new power amp designs is that it will stay stable. I've had a small number that have gone badly wrong in the past and I suspect it comes down to drift from electrolytics forming or some other effects with burning in new components.